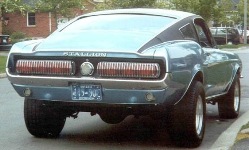 There were eight Mustang Stallions built in 1967 which had Mercury Cougar taillights and vinyl trim on the upper body. 1967 was the first year of the Ford Mercury Cougar, and it was designed and sold as an upscale version of the Mustang; therefore 8 cars were built as a hybrid between the two models. See www.ponysite.de for more info, click New, Special Models then 1967 Stallion from the Superrare area. This ad was placed by Mainway Ford in the July 1967 edition of Canada Track & Traffic magazine. There were 8 of these cars built by Mainway Ford of Toronto, Canada which mixed Ford Mercury Cougar parts with the 1967 Mustang.